It’s been quite a long and sometimes tricky journey for us to open here at Henry On Eighth here in Maylands. For me it has been two and a half years in the making since I sat down with the first gentleman which was our liquor licensing consultant which some would argue is the most important man for this business but I’m torn. The focus for us is on three things as a lot of good venues do. Firstly, our coffee service – so we are using Mano a Mano who is our coffee roaster. He operates out of Gordon St Garage in West Perth and has a big supporter of us for near on 18 months now. We very much look forward to bringing some specialty coffee to Henry On Eighth Maylands. 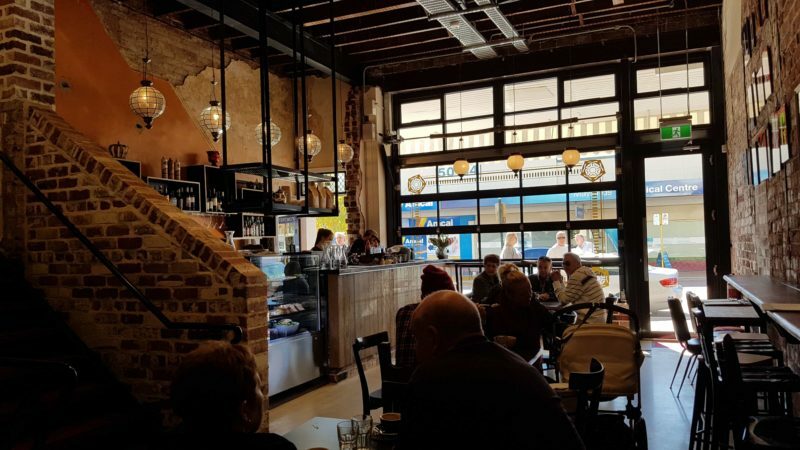 Steve Lavell, owner-operator of Henry On Eighth in Maylands, Western Australia talks about the journey of opening Henry On Eighth in Maylands. The food- our head chef Nathan Tulip will be leading our kitchen. He will have a big focus on quality breakfast and lunch service and then a light supper offering of an evening. And then our bar service where we are bringing in some real quality beverages; beers, wine however we aren’t forgetting coffee. We will serve coffee throughout the entirety of our service. We also will have a handful of house cocktails as well. It’s going to be a busy time for us, a big time, but it gives the opportunity for a lot of patrons to visit us here at Henry in that we will trade from 6am until midnight every day of the week. Beyond our actual food and beverage service, we are looking to bring a really interesting art scene to Henry On Eighth Maylands. We’ve put in a stage, looking to introduce a poetry collective and some story telling. We can plug some acoustic performers in, whether they be a solo artist or a duo. This will provide some entertaining evenings for our patrons here and will provide events that we believe people will want to be a part of. We are licensed for 60 people. So this is stage one for us of two stages. Stage one which is completed now is Henry On Eighth and we have seating to comfortably accommodate about 40 patrons. Then stage two which we hope can happen by the end of 2016 we’re opening “The Kings Above”. Patrons will get an idea of the gravity and size of the job that is to come here as well as part of upstairs is open now being our art gallery space and our bathrooms so they will be able to appreciate the size of stage two. The Kings Above will be a restaurant that will be licensed for up to 120 people. The idea for us is to not necessarily keep as many people as we can in the building, but keep them in Maylands. They can visit some of the other quality venues in the area and join us for food or drinks before or after. They can also make the most of their time visiting the different streetscapes and street art. For me, Maylands is still a hidden treasure. I’ve got friends that live as close as North Perth who don’t really know where Maylands is, don’t know enough about Maylands. I’m as good as born and bred in the area. I spent some time away over East but I’m really excited to be back. I love the cross section of people that live in this area, we have some older people, some middle aged people, some more affluent younger people and families who have come back to the area. We have some refugees, we have some students and in my option without bias I believe it is one of the more authentic strips in Perth and probably of of the most interesting strips in Perth given what’s planned for the next two years through Council and others. Very much looking forward to seeing the regulars down here who have been very supportive of us in getting henry open but also those who have expressed interest about us from other parts of Perth as well. We think that interest will only grow when we open. It’s going to be pretty exciting being able to bring a different level of food to Maylands, something that is new to the area. It is very winter dominated because obviously we are opening up in the middle of winter. It’s going to be vibrant, fresh, with many different flavours covering all different types of genres. I think it’s more sort of a restaurant / café food offering rather than just right out your cabinet toaster kind of food. It will be fresh, hot and delicious and a point of difference to Maylands being vibrant and exciting food. Definitely this area is screaming out for great food venues. You can see it in the vibe already starting to pop up in the streets – the buildings have already been done. It’s got a great vibe about it, it just needs a bit more foot traffic and I think this place here Henry On Eighth is going to be jamming with people because of what we’re going to bring to the area. Maylands is screaming out for new venues n=and I believe the people that usually would go to the Beaufort Street, Mt Lawley strip will come down the short distance to Henry On Eighth in Maylands and be blown away by what we are producing. We have a real point of difference from everyone else on the street so it will be fantastic and exciting. I’m a classically trained Chef and worked overseas for a long time, done tapas in West Perth, opened up a few venues in Joondalup, one in Applecross and previously did Perth Organic Kitchen. Had the opportunity to jump on board with these cool kids here at Henry on Eighth and looking forward to helping put Maylands on the map. I’m really excited to be able to do some really innovative breakfast products, and serve it to some very excited customers. The night time trade is going to be a limited menu to get excited about with other prospects with other venues inside Henry On Eighth. It’s really going to be a light supper menu to match well with the beer and wine and the casual dining at night time. Watch this space however as there will be more dining spaces to come.